Szczepaniak has been a senator since he arrived at Grand Valley State University in 2016 and will now take on the presidency for his senior year. The general assembly had plenty of positive messages about the candidate before he was elected, many noting his impressive accomplishments and reputation in the community. Indeed, the Szczepaniak name does travel thanks to his position as treasurer of the Kenowa Hills Public Schools Board of Education. The youngest elected official in west Michigan, Szczepaniak obtained the position in 2017 as a high school graduate and college freshman. While discussing his plans and qualities for the senate president slot, Szczepaniak assured the senate body he would be able to balance both positions and still be dedicated to his work. He also spoke of his love for teaching which drives his interest for leadership roles education. "I am running to do lifelong learning, to listen to testimonies of others and to work together for the betterment of this great institution," Szczepaniak said. While discussing the candidates, many senators old and new spoke of why they were supporting Szczepaniak. This included the newly elected executive vice president Andrew Nurmi. "Truly one of the most loving and passionate people I have worked with at Grand Valley," Nurmi said. "(Szczepaniak) has a lot of drives and and a lot of ideas to make really big changes at our university." Many of these proposed changes were new solutions to issues many contesting senators hoped to address. This included being more transparent about senate proceedings, increasing campus collaboration and addressing the disconnect between student senate and its students. Senators agreed that improving relations with students would better assist the body in representing them. “We’re students like the rest of them and we want to hear what they have to say," Nurmi said. Joining President Szczepaniak and E-VP Nurmi are: Vice President of Senate Resources Hannah Benoit, Vice President of Finance Madeleine Samuels, Vice President of Camps Affairs Grace McMahon, Vice President of Educational Affairs Autumn Mueller, Vice President of Diversity Affairs Alex Murarescu and Vice President of Public Relations Ryan Fritz. The vice president seat for external relations was tabled for next week's GA as both contenders withdrew and a later senator turned down a nomination. Each newly appointed vice president also had plenty of goals and campaign promises for their committees. Benoit and Samuels expressed a drive for more cross-committee collaborations, McMahon and Mueller posed ideas for outreach education with students and Fritz sided with Samuels on connecting with campus organizations. The elected 2019-2020 body has plenty of big ideas and passions gearing up for next school year, and Szczepaniak is leading the charge. He is especially focusing on reducing textbook costs, following a year-long senate task force that was assigned to look into a lowering this financial burden on students. The finalized recommendations from the task force include implementing a cheaper textbook requirement for each college's highest enrollment course. "If this is implemented, they'll have one year to figure out a plan to successfully convert to using affordable course materials," Szczepaniak said. "That's one thing I'd love to do. Then it will affect every student, even the smaller majors will benefit." The new president's impending goals will hopefully help him in filling the shoes of exiting senate president and first student commencement speaker Rachel Jenkin. Luckily, Szczepaniak has both the government experience and newly elected goal-minded executive board on his side. 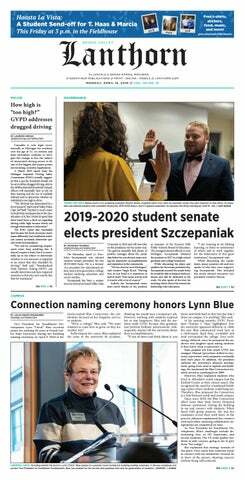 But the new era of leadership doesn't stop at student senate; along with his new senate responsibilities, Szczepaniak will also assist in ushering in the new university president, Philomena Mantella. "I'm real excited to orient Dr. Mantella," he said. "I look forward to creating a great partnership just like we've had with President (Thomas) Haas here at student senate."